FUE hair transplant is one of the techniques of extracting the follicles from the donor area, other technique being FUT. This technique has increased the spectrum of surgeries done in hair transplant procedure. With this technique, grafts from other body areas like beard, upper chest and upper back is possible, so body to scalp hair transplant can be done. This technique has evolved over a period of time and has reached to present day that it is very difficult to make out whether one has undergone hair transplant. The grafts are extracted using the micropunch so the area of the follicle which is inside the skin is not directly visible , so one needs a good understanding of the hair anatomy and also good experience to achieve a very low graft transection rate. The direction and the angle of follicle may change on coming out of skin posing a challenge for the surgeon. The patient having male pattern baldness, generally more than Norwood stage2. The patients who want to have short hair cuts. Repair or correction of previously done surgery. Patients who may require body to scalp hair transplant. Who have already undergone FUT hair transplant and have tight scalp. To cover the scar from previous surgery, injury or burn. When the patient comes to us to have procedure, hairline drawing and final counseling is done. This is followed by some paper work and in the mean time patient is given some medicines. After putting on the procedure room dress and doing some hypersensitivity tests, patient is taken in the procedure room. Monitoring of the vitals is done in form of blood pressure, pulse, oxygen saturation etc. Local anesthesia is then given to make the scalp numb so that patient doesn’t feel any pain after that. Recipient sites are created depending on the natural density, angulations of the natural existing hair and orientation of the hair shaft. The Grafts are extracted in their naturally occurring group of 1, 2, 3 or 4 hair one by one using micro punches and are placed in the recipient site. Before closing the procedure double checking of the grafts is done to ensure proper placement. Patient is provided with some post-operative medicines. What are Recipient sites and How these recipient sites are created? These are numerous small incisions, which are created by surgeon in the area of hair loss where the extracted donor grafts are then placed. 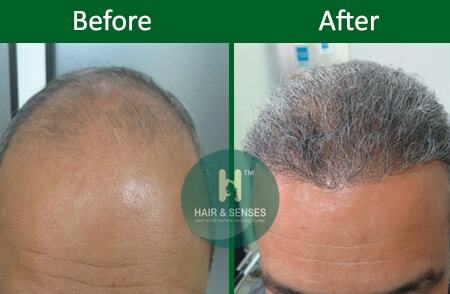 The outcome of hair transplant significantly depends on how these recipient sites are created. The recipient sites are made in such a way that the transplanted hair grows in the same direction and angle as that of the existing natural hair. The spacing and the size of the slit should be such that the graft should not pop out and the graft should fit in properly to ensure good nutritional and oxygen supply to the transplanted follicle. The area from where grafts/ follicles are harvested to be transplanted to the area of baldness is called the donor area. The primary site of the donor area is the back and sides of the scalp as the hair roots in this area are not prone to the effect of DHT. But when the scalp donor area is not sufficient then other areas like beard and upper chest can be used as donor areas in FUE Hair Transplant. In case of scalp being used as donor, the area is shaved by one of our team member depending on the number of grafts needed. The shaving is done mainly using ‘0’ number trimmer setting. In case of beard being also used as donor area then the patient is asked not to shave the beard for 3 days before the procedure and for chest, the shaving should not be done for at least 4-5 days by the patient so that proper visualization and extraction of the donor grafts can be done. The trimming of the area is done at our center according to the need. After the patient is taken in to the procedure room, the area is cleaned with antiseptic solution and the area is anesthetized by infiltrating with local anesthesia. Then the extraction is done by using small punches of around 0.8mm or 0.9mm punches and still finer punches for beard and chest area. During the extraction, we particularly take care that it is done randomly and diffusely to avoid over harvesting in one particular area. Dr. Sangay takes special care to avoid transection and hence graft wastage during the donor harvesting process. Body to scalp hair transplant can be done by this. We invite you to browse through our website to learn more about our practice. Feel free to contact us with any questions you may have about Hair Transplant or Hair & Senses or if you would like to Schedule an appointment!